The first recorded European contact came when James Cook sailed through the Bay of Plenty in 1769. 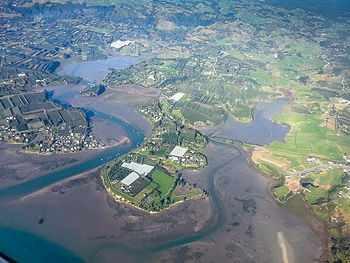 Cook noted the abundance of food supplies, in comparison to Poverty Bay further back along the eastern coast of the North Island. Further reports of European contact are scarce prior to the arrival of missionary Samuel Marsden to the Tauranga area in 1820. During the 1820s and 1830s, northern iwi including Ngā Puhi invaded the Bay of Plenty during their campaign throughout the North Island, fighting local Māori tribes in what became known as the Musket Wars. 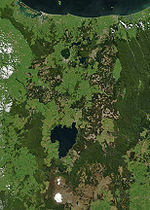 However, the 1830s and 1840s saw increased contact between Bay of Plenty Māori and Europeans through trade, although few Europeans settled in the region. Missionary activity in the region also increased during this time. In 1853, New Zealand was subdivided into provinces, with the Bay of Plenty incorporated into Auckland Province. ^ a b c d e McKinnon, Malcolm (2007-09-27). "Bay of Plenty". Te Ara – the Encyclopedia of New Zealand. Archived from the original on 20 March 2008. Retrieved 2008-02-25. ^ "Our History". Tourism Bay of Plenty. Retrieved 2008-02-25. ^ "M/V Rena Information". Costamare Inc. 7 October 2011. Archived from the original on 20 July 2012. Retrieved 2011-10-12. ^ "'Worst ever environmental disaster'". New Zealand Herald. 11 October 2011. Retrieved 2011-10-11. ^ a b "Our Region". Environment Bay of Plenty. Archived from the original on 2008-02-18. Retrieved 2008-03-03. ^ "Our Coast". Environment Bay of Plenty. Archived from the original on 2008-01-16. Retrieved 2008-03-03. ^ a b c d Environment Bay of Plenty (September 2004). "Bay of Plenty Regional Land Transport Strategy" (PDF). pp. 15–32. Archived from the original (PDF) on 2008-04-11. Retrieved 2008-02-28. ^ a b Mullan, Brett; Tait, Andrew; Thompson, Craig (2007-09-21). "Regional Climate". Te Ara – the Encyclopedia of New Zealand. Archived from the original on 11 April 2008. Retrieved 2008-03-07. ^ "Climate Change". Environment Bay of Plenty. Archived from the original on 2008-02-13. Retrieved 2008-03-03. ^ a b c New Zealand Institute of Economic Research (2005-11-01). "Bay of Plenty Economic Profile". Regional Economic Performance: Final Report. New Zealand Ministry of Economic Development. Archived from the original on 4 April 2008. Retrieved 2008-02-28. ^ "Integrated Transport Strategy for Tauranga" (PDF). Tauranga City Council. Archived from the original (PDF) on 15 October 2008. Retrieved 2008-04-21.